Hello friends, I have a card share for you today featuring this cute elephant called Elephant Party from The Papernest Dolls. This image is so versatile. You could use it for birthday, a baby announcement, the possibilities are endless. I am loving these cute animal images that Christine has created. I started off by creating the background using distress inks and a background stencil by Craftin Desert Divas. I used a scalloped rectangle die from Jaded Blossom to cut the background out. I layered the background on the card front. I colored the image using copics and cut it out using my brother scan and cut. I adhered the image on the card front using foam tape. I die cut out the sentiment from Simon Says Stamp happy birthday die. I added it to the bottom of the card to finish it off. I am loving this card and all of the cute animal images that were released this month. Check out the store for this and other cute images to create with. Thanks for stopping by and we will chat soon. Hello friends, thanks for stopping by today. We have a new challenge up at Crafty Sentiments Designs. This week it's anything goes and I decided to use Phone Call for my project today. This image is perfect to send to a friend you love talking to. The designer papers I used are from my local craft store. I love the colors, they're so bright and cheerful. I colored the image using my copics. I used a stitched circle die to cut out the image and layer it on a scalloped circle die. The sentiment is from stamp set in my stash and I added it to the bottom of the card. I finished the card off by adding some enamel dots from my stash. I love the way this card turned out. 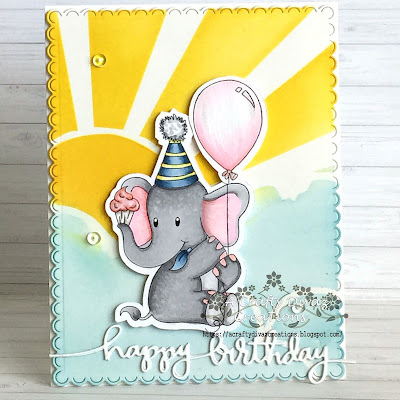 Don't forget to check out Crafty Sentiments Designs blog to see what the other talented ladies created for this challenge. That's all I for you today, thanks for stopping by and have a great Tuesday. Hello Friends, Happy Saturday to you. Hope you are enjoying your weekend as I am. 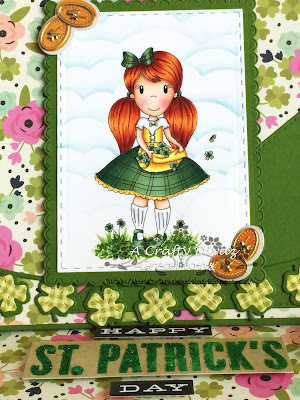 Today I have a card share using Papernest Dolls Ellie with Cloves. 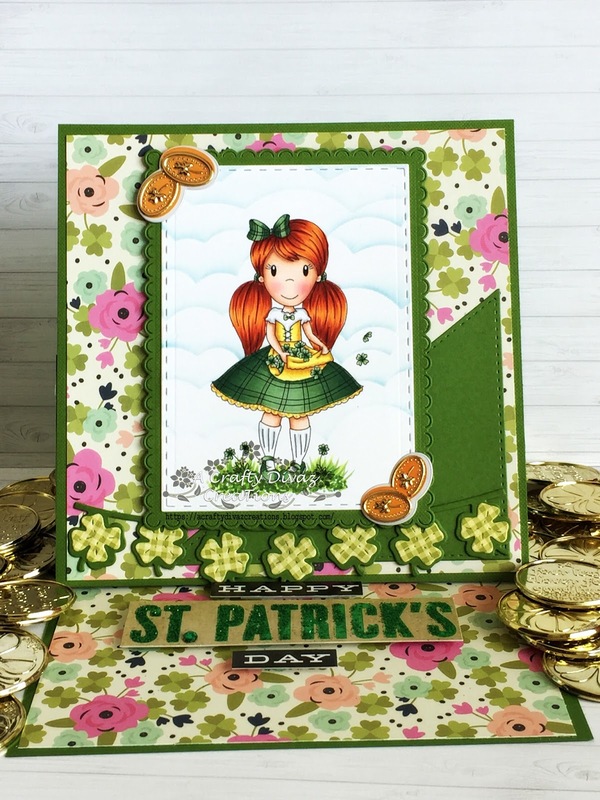 Since today is St. Patrick's Day, I decided to create a easel card using this cutie. I just love the way this card turned out. I used simple stories St. Patrick's Day paper collection to create this card. I colored the image using my copics and some clouds the background using MFT cloud stencil. I cut her out using jaded blossom stitched rectangle die. I layered the image using the jaded blossom rectangle scalloped die. 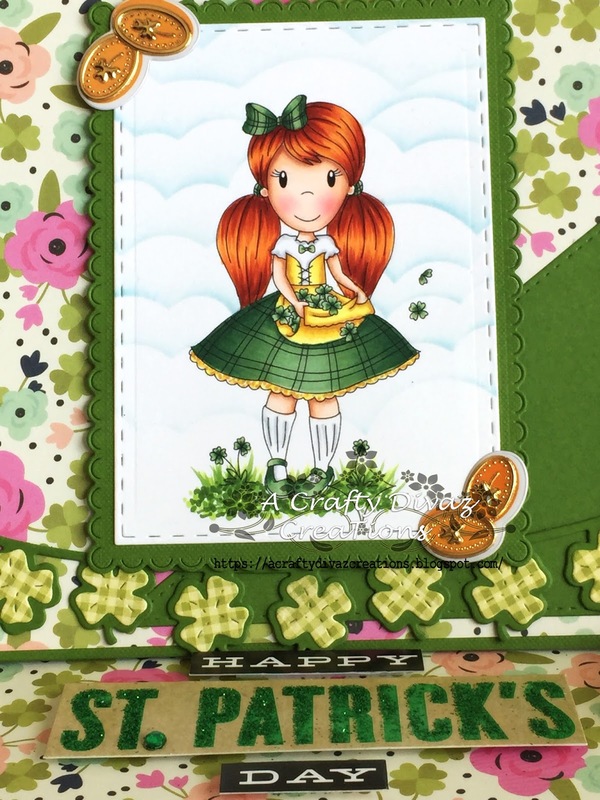 I then added the four leaf clover banner from jaded blossom to the bottom of the card. I finished the card off by adding the 3D sentiment to prop the card up. That's all I today, thanks for stopping by. Don't forget to stop by The Papernest Dolls shop and check out this and other cute images to create to with. Have a great weekend and we will chat soon. Hello friends, thanks for stopping by today. This week we have a new challenge going on at Crafty Sentiments Designs. 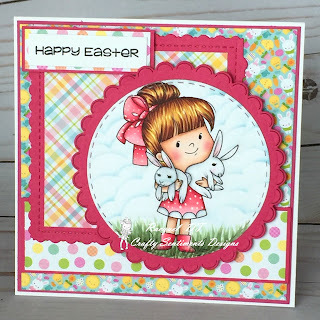 The theme for this week is Easter and I decided to use Easter Companion for my card today. This cutie is perfect to create those spring and Easter cards. I used doodlebug bunnyville designer paper to create this card. I colored the image using copics. I added clouds using a cloud stencil from my stash. I cut the image out using a stitched circle die and added it to the card. I finished off the card with an Easter sentiment. That’s all I have for you today. Don’t forget to check out what the other talented ladies have created this week. Thanks for stopping by and have a great day!